The 2016-2017 bowl season will kick off with a battle of two pretty big surprises. New Mexico has been solid over the last few years but they have had a better 2016 than many imagined, and are now just one victory away from just their fifth nine-win season in program history. Meanwhile, UTSA will be playing in their first bowl game ever after winning six games in the crowded Conference USA. The Roadrunners know what they need to stop to have a shot at beating UNM: the ground attack. With nearly 361 yards a game on the ground, the Lobos have the No. 1 rushing offense in the entire land, topping offenses that usually find themselves up there, like option-orientated Georgia Tech or Navy. Backs Teriyon Gipson and Tyrone Owens give New Mexico a dangerous two-headed attack, particularly Gipson, who is coming off a 217-yard day in the team's season finale over Wyoming. UTSA's rush defense is inconsistent and while it has faced many high-octane offenses in the C-USA, adjusting to this ground game could prove to be challenging. The Lobos don't do much through the air, but Washington State transfer Austin Apodaca has a big enough arm that the Roadrunners have to be prepared for the long pass. UTSA has a solid running back themselves in Jarveon Williams (775 yards in '16) and don't turn the ball over. However, the aerial attack is not very diversified and New Mexico has an athletic defense. Unless the Roadrunners can find some magic or completely shut down New Mexico on the ground, they are going to be in for a challenge. UTSA is a great story (the fastest program to go from a startup to bowl-eligible) but they could be overmatched against the skilled Lobos. Two of the nation's best non-Power Five teams are set to collide in Las Vegas, as the 9-3 Cougars hope to overtake the underrated Aztecs. Life after Tom Herman begins for the Cougars, who went 22-4 under the head coach, before he left to take the job at Texas. New head man Major Applewhite still has enough talent to lead UH to a victory. Senior signal-caller Greg Ward Jr. is still one of the nation's best, and his dual threat ability should give the SDSU defense issues. On defense, Houston not only has a ball-hawking secondary but one of the nation's top freshman in defensive linemen Ed Oliver. Oliver will hope to create enough chaos to disrupt the extremely efficient and methodical Aztec offense. 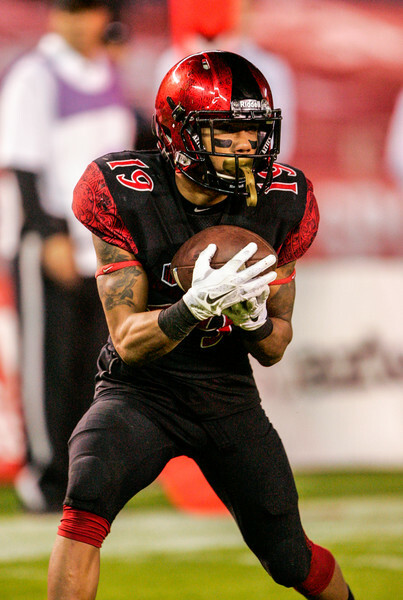 That offense is headed by Donnel Pumphrey, who finished the year with 2,018 yards and 16 touchdowns. Pumphrey is a dynamic ball-carrier that can break the game open at any moment. The Cougars' defense has played well on the year, but is still prone to big plays, which could be extremely worrying. That defense will also be tasked with stopping quarterback Christian Chapman. Chapman does not exactly stuff the stat sheet full (1,866 yards and 19 passing touchdowns on the year) but he does the little things well and has proven he can overcome tough defenses. An important factor in this one could be the motivation level. The Aztecs are fresh off a Mountain West Conference Title and eager to prove they are a Top 25 team, while Houston's younger guys will hope to have a big day to insure their future under Applewhite. It should be a fun game, but the Aztecs are the more balanced team. They should be able to pull off this one in a thriller. If you like offense, Toledo may just be the team for you. The Rockets went 9-3 this season, thanks in large part to their explosive O, which averaged nearly 530 yards per game, along with 38.8 points per game. They are hopeful that offense can lead them to a victory against a sound Appalachian State team, who finished off the season 9-3 and remains incredibly consistent. The Rockets will turn to their stars at the skill positions, namely gunslinger Logan Woodside, who finished off the season with 43 passing touchdowns. Woodside will be supported by fabulous back Kareem Hunt (1,355 yards, eight scores) and a number of weapons on the perimeter. That should be enough to give App. State enough issues on the defensive side of the ball, even though the Mountaineers have shown they can handle talented offenses (see the season opener against Tennessee). While Toledo is explosive and up-tempo, Appalachian State thrives because of a smart, controlled offense. Senior QB Taylor Lamb has a great mind for the game, and can hurt you with his legs just as much as his arm. Paired with sophomore Jalin Moore, the Mountaineers have enough to keep pace in the scoring battle. Turnovers could play a huge role in this one, as they often do. Toledo scores often, but they have struggled with turnovers on offense, as while as forcing them. Meanwhile, App. State doesn't turn the ball over very much, and the defense is much more consistent. With that in mind, they should be able to overcome Toledo's explosiveness. No matter what, expect plenty of points in another bowl that should be down to the wire. Last season at this point, Central Florida was coming off a disastrous 0-12 season and preparing for what appeared to be a long rebuild. Instead, they have made quick strides under former Oregon offensive coordinator Scott Frost, who already has them in a bowl. The Knight are a defense-orientated team that has plenty of experience on that side of the ball. Offensively, they are fairly balanced, but don't have many perimeter playmakers. They will get a tough test from one of the most consistent Group of Five programs in the country, Arkansas State. The Red Wolves started off the year slowly once more, but caught fire inside the Sun Belt. Arkansas State is extremely balanced offensively, with big-armed quarterback Justice Hansen joined by solid back Warren Wand. However, the real strength on this team is what can be a stifling defense. The group allows just around 22 points per game (tied for 24th nationally) and has had some dominant moments, like when they held 9-3 Troy to just three points, in a resounding 32-point victory. That group should be hyped up and ready for the Knights, and it could be very physical. While many of the early bowl matchups I could envision being shootouts, I could see this being more of a defensive struggle. This bowl will be played in Orlando, so it is basically at home for UCF. However, I think Arkansas State is very hot right now, and has a more experienced team ready to bring this one home. Talk about different ways to start your season. Southern Miss opened up 2016 with a victory over an SEC program in Kentucky (who ended up 7-5, by the way) and started off 4-1 with their only loss being to Troy. Meanwhile, the Ragin' Cajuns opened up 2-4, including three straight losses towards the midpoint of the season. While Southern Miss has lost live of seven, Lafayette has trended the other way, and here they meet. The Golden Eagles have tons of talent, namely veteran quarterback Nick Mullens (2,926 yards, 26 touchdowns) and underrated back Ito Smith (1,321 yards), but they made too many mistakes last year. Defensively, they were putrid at times, surrendering 55 points to UTSA, and 45 to a pedestrian LSU offense. Controlling Elijah McGuire, the Cajuns' elusive back could be a trouble. LSU transfer Anthony Jennings has fit right in with the Cajuns, and should look to throw all over a weak Golden Eagles' secondary. However, that offense has had some poor moments all year, namely laying a zero against Appalachian State. With that in mind, the edge has to go to Southern Miss, even if they are trending in the wrong direction. If the defense can play hard and make a few stops, they should be in prime position to push to a victory.